ON TRACK: Having trouble keeping pace with the 100-plus races taking place here annually? Sprint over to www.runningintheusa.com or www.active.com for a directory of events by state and zip code. 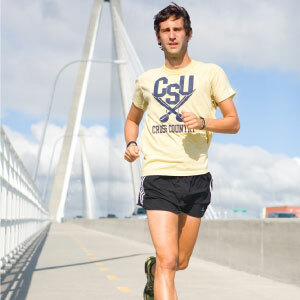 Who: Ryan Thompson, age 28, is the Cross Country and Distance Coach for Charleston Southern University. The downtown denizen also works part-time at On the Run. Street Cred: Ryan was the second local finisher in the 2009 Bridge Run, earned the runner-up spot in the 2007 and 2008 Kiawah Island Marathon, and finished—you guessed it—second overall in a marathon on Sauvie Island, Oregon, in July. But this summer, he had a first: Ryan coordinated the inaugural Charleston Southern All-Comers Track Meet series, where anyone could compete in timed track events for just $5. Best Run: Ryan and his wife, Anna, participate in the annual Turkey Day Run through downtown Charleston every Thanksgiving. MOUNTAIN TO SEA: Currently comprising almost 290 miles of passages, the Palmetto Trail will eventually include more than 425 miles of hiking and biking paths from Oconee State Park to Awendaw.